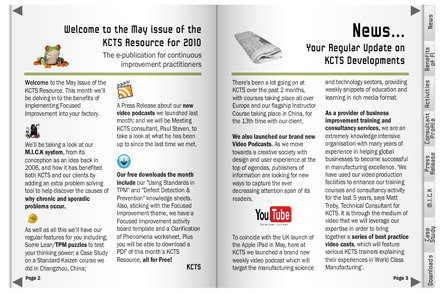 Don’t forget that the May Issue of the KCTS Resource has been released: This month we’ll be delving in to the benefits of implementing Focused Improvement into your factory. This entry was posted on Monday, June 14th, 2010 at 11:47	and is filed under KCTS Resource. You can follow any responses to this entry through the RSS 2.0 feed. You can leave a response, or trackback from your own site.